What are you doing on Sunday November 3? Nigeria’s leading stand-up comedian Tee A wants you to clear up your calendar, as he plans to deliver another live concert featuring some of the biggest names on the continent today. The respected entertainer announced today that he’s hosting the Lagos edition of Tymeout With Tee A Live Concert at the Intercontinental Hotel on Sunday November 5; with headliners including international music superstar D’Banj, iconic pop acts and one of Africa’s most decorated entertainers 2face Idibia, queen of pop Tiwa Savage, revered lyricist Sound Sultan and a special Jump Off segment with Africa’s number one jockey DJ Jimmy JATT. The spectacular line up was unveiled today, as Tee A revealed plans for this year’s Lagos show. An Abuja edition held earlier, with Banky W, Lynxxx, Basketmouth, Iyanya, KCee and others. The November 5 event will also feature electrifying performances by Princess, MC Abbey, Omo Baba, Akpororo, Helen Paul and the hit Shuga Band. 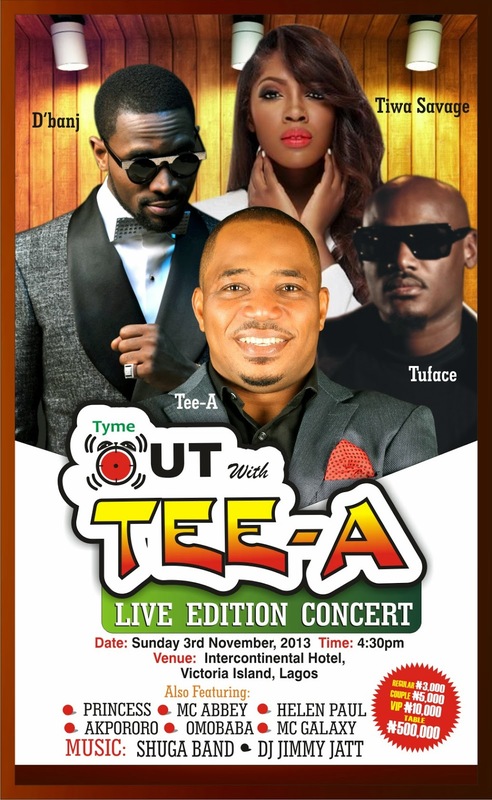 Tee A, who pioneered live comedy events in Nigeria with his nineties Live ‘N Naked series, will host the event which is a live presentation of the popular TV show Tymeout With Tee A.
It’s D’banj’s second time on the show and Tee A says the charming entertainer is ‘back by popular demand’.